Quite a few fantasy games are set in more-or-less static fantasy worlds; there’s an equipment list that shows what gear is available – and it’s pretty much the same everywhere you go, and throughout much of the history of the setting. A few GM’s will put a couple of local items on it for each major location – but most people expect things to focus on their characters. Equipment, like the peasantry and their lifestyle, and the cities, and the rest of the setting, is… backdrop. Unless it’s a personal item of unique or semi-unique gear, in which case it’s generally a prop for a character to use, and is “cool backdrop”. Still, you do get players who want their characters to be comic-book style mad scientists, or inventors who actually have an impact on the setting, or who simply want to avoid being yet another warrior-with-magic-weapon or spellcaster. If you want an inventor who actually develops new technologies and introduces them into the game world… You want Action Hero/Invention. Specialized for Double Effect / only works in your workshop or laboratory (no on-the-fly jury-rigging or brilliant ideas for you!). If you want to preserve those options, just buy it again without that limitation. If you want to spread your inventions faster, you need a team – like Edison at Menlo Park. Buy Leadership and get a bunch of followers with Action Hero / Invention (Specialized/only to reduce inventions to practice) and have them spend their action points to bring your creations into common use. This will take time (often many years), and effort, and planning – but it will allow you to start changing the setting for a mere 18 CP – the rough equivalent of a one-level “dip” in classical d20. Go ahead. Invent a new alchemical elixir of healing, or a way to store self-triggering spells in careful arrangements of crystals, or introduce steam engines, or whatever. Of course, this is somewhat realistic, and probably won’t be all that big a “personal power” factor. On the other hand, you will need to level up to get more action points, and to improve your assistants – which means a motive for adventuring beyond having to meet the threats from all the groups that will feel menaced by technological improvements. That does bring up a question… What is an “invention”? Works under the local laws of physics. Can be modified, and it’s principles applied to other situations – thus leading to families of related inventions. Can have it’s design recorded, and used by others. Can be reproduced by people with far less skill than is required to invent it. In fact, the necessary steps can be broken down until groups of almost unskilled people can produce items – the principle of the assembly line. Can be improved, and rendered less expensive, as technology advances in other areas. Can incorporate natural materials to solve problems – for example, rubber tires. Necessarily includes various sub-inventions. For example, you can’t have brain transplants without a LOT of other surgical inventions, microsurgical equipment, and many other devices – not without magic anyway. If you want a character like Batman or Iron Man – comic-book style gadgeteers who pull out whatever-it-is they happen to need but only do it every once in awhile – then you want to buy a bit of specialized magic. A dabbler can get along with a bit of Mana, Rite of Chi, and some rune magic to enhance and modify items. A beginner might want to look at some of the “Tech Wiz” packages over here. A more serious gadget-user might want a Greater Invocation effect as an innate enchantment – such as Yuki, and her “Ninja Mastery” power. Ninja Mastery (Unlimited-use Innate Enchantment, level three spell – “Greater Invocation of Ninja Conjuring”): Yuki may endlessly pull out minor items of ninja gear – smoke, flash, and gas pellets, flaming arrows, flares, sleeve-firing grappling lines, swim fins, camouflage clothing and makeup, rope, excellent lockpicks, sneezing powder, shuriken, forged papers, crude paragliders, and so on, pretty much at will. No one knows where she keeps the stuff. These have effects equivalent to those of a first-level spell and only work for her. That will be expensive – as might be expected for something with unlimited use and a wide range of applications including combat – but it can be pretty handy. Mad Science: Inherent Spell/Greater Invocation, producing any mad-science effect of up to two levels below the level of the spell used. Specialized and Corrupted:Requires gadgets to work though. It normally takes several hours, a workshop, and a DC 20 Knowledge/Architecture and Engineering roll to change out gadgets and they can – of course – be fairly readily damaged, destroyed, or taken away. Only allows the user to have (Intelligence) specific gadgets ready at any one time. General items take up two of these “slots”, while very general items (perhaps a “Tissue Regenerator”) require three. Gadgets require a Knowledge/Architecture and Engineering check to use. They malfunction on a roll of “1″ and always fail on a roll of “2″. The DC is generally ( 10 + twice the level of the spell being emulated). Damaged gadgets penalize the check accordingly. Gadgets incorporating special magical or “power” materials may yield improved results, but this is wholly at the game masters option. That provides double effect at two-thirds cost, Inherent Spell (Greater Invocation at level six, produces technological effects of level four and under) with +4 Bonus Uses. For a mere eight CP – and putting up with all those limitations* – you can put do quite a few things. Are you wearing your rocket boots? Break a fall, fly away, cover long distances, brace your back against a wall and incinerate your enemies, blow a door open, accelerate your movement speed, send up a flare to let people know where you are, heat other people’s armor, create a wall of fire, or whatever. As long as you can make the roll, get creative; that’s what this package is all about. *It’s still a pretty good deal, although Specialization for Increased Effect on Inherent Spell may be a red flag for the game master. In that case, you’ll need to spend more CP to take some lesser Inherent Spells to work up to the big one – but this will let you use your toys to produce minor effects more often anyway. You can take this general route further; for example, Dr Wrath is a power-armor super-villain (or hero, depending on how you take his posturing) with a nigh-endless array of gadgets built into his armor. His design includes some definite cheese – but he was built for an anime-style setting. A more conventional build would probably spread those abilities out over rather more levels – but that depends on the game. Gadgeteers, Cyborgs, and Power Armor characters with relatively consistent sets of abilities can be built either through the Talents rules (details and some samples can be found in The Practical Enchanter), as the Mutants of the Eclipse series did for the Gadgeteer, or in several other ways – most simply buying the relevant abilities directly and applying appropriate Specializations and Corruptions (expensive, can be disrupted by electro-magnetic pulses and other effects that would disrupt whatever kind of technology you’re using, can be removed or disabled with effort, obvious to relevant forms of detection, and so on) to taste, as Jeremyn here does. If you simply wish to be able to make some strange and terrible items, go ahead and buy an Occult Skill (3 CP) or relevant special ability and a privilege or contact which provides access to the necessary materials. If your terrible death-powered devices require the raw life force of dying people to activate… well, you may be able to find work as an executioner. If you wish to practice Glowstone Alchemy (Part 1 and Part 2), you’ll need access to the skill and to a supply of Glowstone. If you just want to carry out strange experiments, you may simply need an immunity to the usual limitations of a particular skill; for an example of that you can look at Haurgrim The Sagacious. This sort of thing is generally distinctly secondary to a character’s major abilities – but it can certainly add a lot of flavor and some useful options to a build. If you want a super-scientist type who can rebuild his or her gadgets to suit particular missions I’d go with buying 3.5 Psion levels; just swap the inherent powers for needing to prepare powers in advance (no cost change) and Specialize and Corrupt it – each “power” must be built as a physical device, this takes at least four hours per level of the effect produced and involves either moderate costs or GM-required special ingredients, such devices are considered technological; they require proper maintenance and may malfunction if mistreated (no warranties are included), they are relatively large and bulky, can malfunction, and require that the game master be satisfied with the players explanation of how they work – although pseudoscience is certainly fine – and are subject to any inherent limitations derived from that explanation. The increased effect is that the user’s power may be committed to such devices, and will continue to empower them for multiple uses or for lengthy periods as long as some other sort of consumable resource is used up. Thus you could use an energy-projection discipline to build a “flamethrower”; there would be the nasty possibility of the tank blowing up, or a backfire, or some such – but if the discipline normally cost five power points to use, investing five of your power points in the flamethrower device would let you blast away until the tank ran dry and you had to buy more fuel. A first aid kit built around a healing discipline could be used until it’s supplies ran low, that strength-boosting exoskeleton would work until it’s little steam engine ran out of coal (or you fell into water and the fire went out; the little smokestack and steady chugging may cause problems as well in some situations), and an intelligence-boosting mental amplifier might work until it’s crystals cracked or it’s battery went dead (or the glass broke and the acid ran down your leg). Refusing to believe in magic is an optional extra. Now, the original question related to a custom “Inventor” class to be found here. Taking a look at that, it’s a bit of a mess. The way it seems to be set up is that “Tech Points” – even if the scale and bonus points look a lot like a Psion’s power points – are nothing but a measurement of how many features you can put into a gadget. The problem is that this has nothing to do with inventing. The class’s “Inventions” don’t seem to have any of the qualities (above) of a genuine “invention”. I didn’t have time to read the entire 54-page thread – but modifications and special notes usually get imported into the page-1 writeup and I don’t see any discussion of what happens if you make blueprints and give them out, or copy things from another inventors book of designs, or try to develop an item that isn’t on the list, or even of most necessary sub-inventions. These “Inventors” don’t seem to advance the overall technology of the setting at all; instead they treat their “inventions” as class features. Their limitation is that it takes a high-level “inventor” to build them and that they’re expensive. In fact, at 10 GP per Tech Point, quite a lot of their costs are directly derived from magic items; just look at the attribute boosters. The tech point cost has simply been arrived at by dividing the cost of the equivalent magic item by ten. Thus, for 150 GP an inventor can build a Flameless Safety Lamp. Of course, for a few silvers a decent craftsman – once given the idea – can make a safety lamp with a water reserve that douses the wick if it’s tipped, knocked over, or broken. 1) The ability to substitute working time and buying GM-required skill ranks in assorted “technical” skills for search time and buying GM-required social contacts and ranks in Gather Information. That’s more reliable – but is more limited in terms of what you can get given the wide variety of possible “technical skills”. 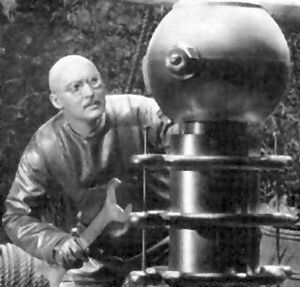 Overall, that’s a bit of a wash.
2) The ability to have the items you obtain count as “technology” rather than as “Magic” – and thus gain immunity to “Antimagic” and “Dispel Magic” in exchange for potential malfunctions, whatever maintenance the game master feels is required, and a vulnerability to appropriate countermeasures. This is still an advantage though; most GM’s will have “dispel magic” flung around a lot more often than “disrupt technology”. For this version just buy Equipage with Purchasing, Specialized for Increased Effect; the items produced are considered technological, rather than magical and the items available are limited by the user’s technical skills and ability to describe how the items “purchased” could function. The Specialization is – of course – the need to spend anything from hours to days (depending on what you want to buy/”make”) tinkering in a workshop. That’s a mere 12 CP – about right for what’s basically a specialized tradeoff. There are more ways to build “technos” of course – this is Eclipse after all – but that ought to be enough for the moment.